It may not seem like millennials and baby boomers have a lot in common, aside from the fact that they make up a huge chunk of the U.S. population. But the two generations do share some similar traits when it comes to spending and investing. This is already having a significant impact on the economy and the stock market, and will continue to do so. Here are some key ways that baby boomers and millennials are impacting business and the markets. There's a lot of noise related to the Affordable Care Act and a possible replacement. How things will shake out on Capitol Hill is anyone's guess, but there's no doubt that Americans will be spending more on health care. Baby boomers make up an increasing percentage of the U.S. population, and will require more medical attention as they age. This means big profits for pharmaceutical firms, but also biotech companies, hospitals, and manufacturers of medical equipment. The S&P 500 Health Care Index has seen annualized returns of more than 16 percent over the last five years, and is up nearly 12 percent in 2017. Expect the upward trend to continue. Millennials are aware of the obesity problem in America, and many of them are making lifestyle choices to counteract that. We've seen a push for more natural and organic food items, and a desire for less sugar and fat. This also means a continued expansion of fast-casual restaurants that offer healthier options, perhaps at the expense of traditional fast food chains. Baby boomers will help fuel this push to health as well simply by following doctor's orders to eat healthy as they age. Boomers have no interest in seeing their retirement savings cut down by high expense ratios and commissions, and millennials are becoming more savvy about the impact these costs have on their portfolios. These two demographics have led the charge against fees, and we've seen some brokerages respond. In February, Charles Schwab and Fidelity cut their online trade commissions to a mere $4.95, and many brokerage firms have expanded their offerings of commission-free exchange-traded funds (ETFs). Meanwhile, investing in low-cost index funds has ballooned; nearly half of all assets placed in mutual funds and ETFs are indexed rather than in actively-managed accounts, according to Morningstar. Aging baby boomers can be expected to withdraw their investments or at least shift their portfolios to more conservative investments like bonds and cash. Meanwhile, millennials are wary of the markets in general after living through the stock market declines of the early 2000s and 2008. 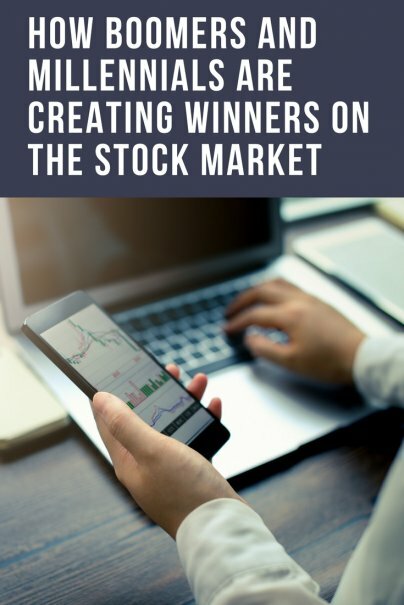 Millennials have also learned that trying to beat the market by investing in individual stocks is generally a fool's game. This shying away from individual stocks could impact the overall returns in the stock market over time. There has long been a common thought among investors that big, popular brands will always be surefire investments. Investors have long banked on the notion of brand loyalty as a driver of investment returns. But there have been several recent reports that millennials are not as brand-loyal as their predecessor generations. Millennials will go for value and quality, and aren't going to stick with a single brand out of stubbornness. This may have implications for stocks that have performed well over the years in part due to brand recognition. We're already seeing retail chains struggling, with H.G. Gregg, Gymboree, Rue 21, and several other brick-and-mortar outlets declaring bankruptcy in recent months. Meanwhile, online retailing giant Amazon just reported a 23 percent increase in sales, to $35.7 billion. Millennials don't mind shopping online, and baby boomers are less likely to go out on long shopping trips as they get older. Millennials don't really care about owning things. Instead, they get satisfaction from experiences like fitness classes, travel, or eating well. To the extent that they need items such as music or movies, they prefer to obtain them through streaming services such as Netflix (one of the hottest tech stocks in America) or Spotify. Meanwhile, baby boomers are getting older and aren't in the habit of acquiring more "stuff," either.